I have been doing things! Just very slowly lol. Work on Big Seamus and one of the young nephilims. Sorry for the pics, I'm not great at photography. The green of Seamus' ripped waist coat, is coming along. As always my camera work lets it down but there is some yellow in the highlight moving to blue in the shadows, probably have to push it a bit more now I've seen these pics. 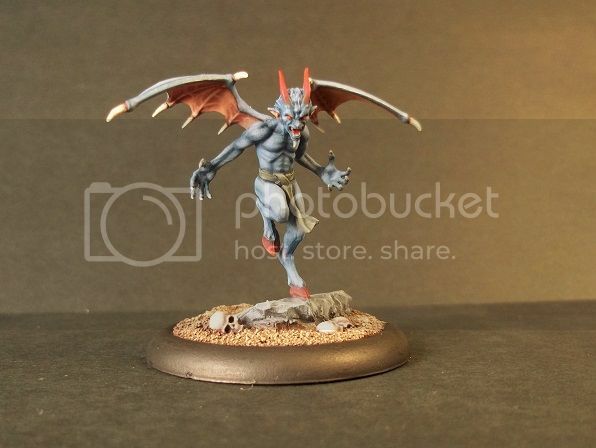 The young nephilim is a really cool little model and I'm enjoying painting it a lot. How they get it so detailed at that size is quite amazing. I tried to go with the box art for it. I also finished this, which was the present I painted for someone. Once I learn how to take slightly better photo's I'll be a happy man, but I'll probably put this up in the gallery soon anyway. I have to say this was a fantastic figure, and someone out there will do a great job on this. Oh I should add, I considered doing NMM on the gold sections of Judge Dread but in the end thought that the yellow was more 'cartoony' and fit in with the comic book look better. All comments welcome. 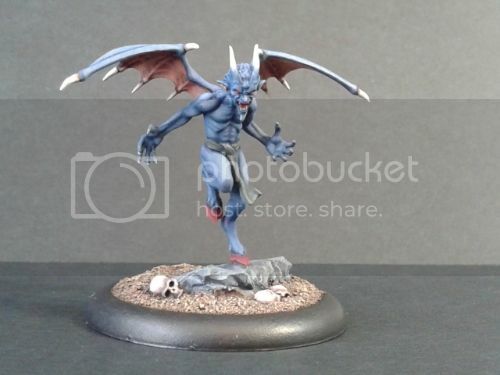 Basically finished the first nephilim, I'm quite pleased with it. 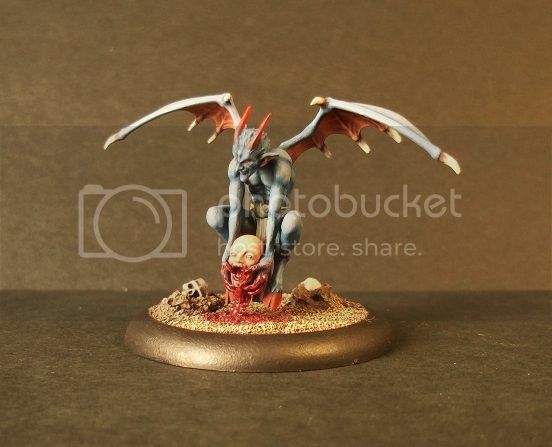 Malifaux make very fun models although smaller than I'm used to. 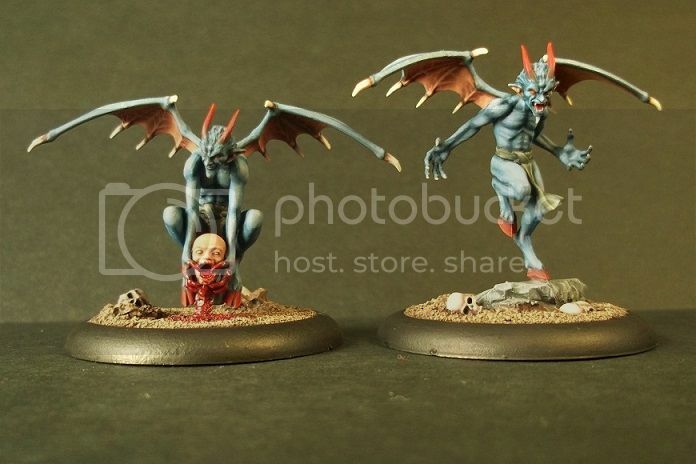 Hi guys, I've finally finished these cheeky little devils (or nephilim lol) from Malifaux. They were a lot of fun to paint and pushed me a bit as I'm not used to their small size. I mostly copied the box art apart from the horns really. Apologies for the photos, as always I struggle there, and the severed head has flashed up quite a bit. But never mind. Any comments welcome of course! Nightmares dude, you are going to give me nightmares. The demons are awesome btw. yes these are really nice. 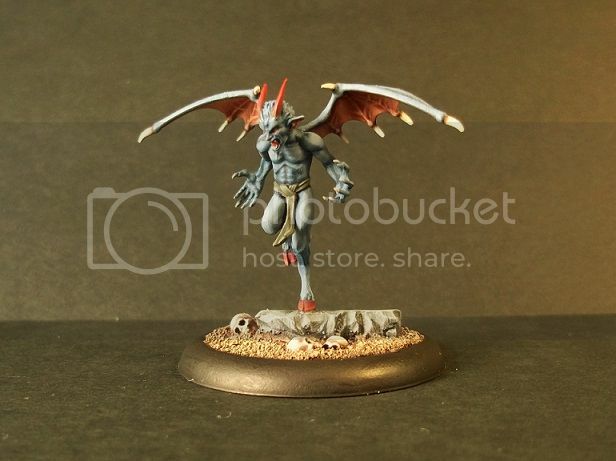 do you fully assemble these before painting? Yeah DMcc I do, and it can be a pain in the proverbial... But also I prefer just getting it done. And although it's annoying trying to get to all the nooks and crannies anything you really can't get to will probably just look ok shadowed anyway I think. Cheers for the appreciation! Ahhh, I have those tykes still on the sprue, they're tiny! 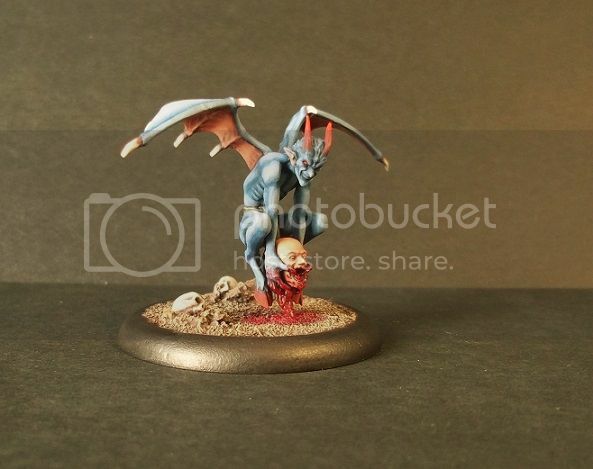 The red-blue contrast is very eyecatching, great work. Just finished Big Daddy Seamus. Tried a little bit of osl on the eye, which I'm relatively happy with. At least it's given me a bit of a better idea of how to do it in the future. I made a school boy error with this though, started it a few months ago, took a break from it and came back a week ago.....to find I couldn't really remember how I'd done some of the shades, etc! Nevermind, I still enjoyed finishing it. 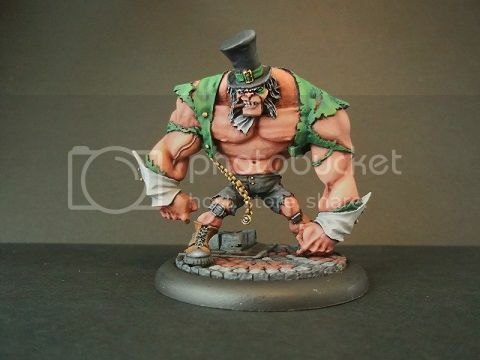 It was one of the coolest Avatars Malifaux did imo. Yes the undersides of the wings look great, The wrinkles and stretches are nicely represented. The Seamus is great too. Ill keep checking in on your work in hopes of picking up some tips and ideas.